Be focused and fun, thus not waiting for organisation-wide things to be initiated and organised by HR or anyone else, as small is beautiful in this regard. Communicating richly and regularly, that is on the critical detail of the job, but also on getting to know all of their team as people as well as workers/employees through taking a keen (but not an interfering interest) in their non-work lives. Creating social context, whereby managers work with team members to encourage them towards increasing collaborative activity, the taking of ownership of their total role and responsibilities, and critically putting in place the enabling conditions for individual and team success. Encouraging anticipatory thinking, rather than purely adaptive thinking - this on an individual and team basis. 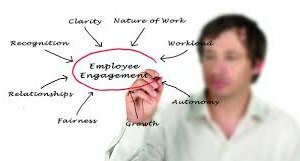 Putting in place some Wellbeing initiatives that clearly demonstrate to staff that the organisation takes a holistic approach to staff and develops their skills in 'switching off to better switch on', which ultimately enhances resilience, commitment and productivity. We have deliberately kept the above thoughts to bite-size chunks as start points for building or enhancing a culture of engagement. This must start at senior management level and percolate down; it may also need some element of development/coaching to ensure that the critical parts of the message get across, achieve commitment and above all are followed through.